Another year, another Inbound conference. This year’s gathering of inbound marketers and salespeople topped the 18,000- person mark, making it clearly the largest marketing conference in the world. Once again HubSpot did a great job of putting on a show, building the community and enabling great conversation to occur. In an earlier post, I shared the product announcements HubSpot made. Today, now that I’ve had some time to ponder the event, I’d like to share my key takeaways from Inbound 2016. Overall, I was struck by the growing maturity of inbound marketing and how fresh and new it remains at the same time. It is increasingly clear that inbound marketing and demand generation are becoming core disciplines to the modern growth playbook. While the importance is clear, the success formulas are still being created. Here are my five key insights from this year’s conference. If you’re a big fan of baseball you know what this means. For those that don’t, moving the line simply means stringing together hits and moving down the lineup. It’s a term used when a team is scoring by getting players consistently on base, rather than by merely hitting home runs. As I shared in my review of the product announcements at Inbound, forward leaning companies today are focused on optimizing processes and “moving the line.” While every now and then there’s the opportunity for a big move - a home run - the winners of tomorrow are the ones who will be able to string together consistent improvements over a sustained period of time. 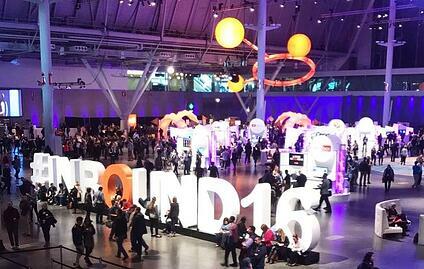 This year’s Inbound conference fully embraced sales. From a dedicated track focused on sales topics, to several sessions dealing with sales enablement and other acceleration tactics. In my presentation on Sales Enablement, I’d estimate at least 2/3rds of the audience were marketers, and the conversations I had with them after the session demonstrated just how much more they are thinking about the sales side of the equation. This is very good news, as the role traditionally thought of as marketing is becoming increasingly important in both driving sales opportunities and supporting the actual sales effort. As Brian Halligan, HubSpot’s CEO, shared in his keynote, “In 2006, a company’s website augmented the sales reps. In 2016, the sales reps augment the company’s website.” If you’re not viewing marketing through a sales prism - or, God forbid, you don’t have a defined marketing program - you’ve got some catching up to do. One of the things that I both love and hate about this space is just how fast things change, and the plethora of opportunities to apply new strategies and drive greater heights. While on one hand this is very exciting, it’s also insanely complicated and overwhelming. Demand generators are drowning in opportunities, and yet they seem to be increasingly starved for high quality, predictable execution. As marketing and sales spending is going up - with the intended purpose of lowering the cost of acquiring qualified leads and acquiring customers - the reality is that the only result is increasing costs. Now more than ever, you must have a clear, proactive strategy and roadmap for execution. You must also increase the focus on iterations and increments, rather than on making big moves. With so much happening the pull to take you off course is greater than ever, and still expanding. You must have a process in place to keep you on your track, rather than falling for the siren song of the next great tool. My favorite part of conferences like Inbound are the conversations I get to have with other practitioners and thought leaders. It’s not only exhilarating to connect with people doing what you’re doing, it’s also a great opportunity to get a firsthand feel for what’s really resonating and where things are. Over the last 12 months, I’ve seen a tremendous increase in the level and value of the conversations taking place. Where conversations used to be focused on basic things around creating content and landing pages or posting to social media; now the conversations are about increasing lead quality, driving more through the funnel and utilizing data and metrics effectively to make better decisions. To be clear, there’s still a lot to learn. The biggest challenge about charting a path that’s never been charted before is that you can never be clear on what you don’t know. What you can do is chart progress, and the progress is amazing. Here again, this means that if you’re still waiting to “figure it out” and you’re not full scale executing a demand generation strategy, the gap between you and your competition is going to increase at an expanding rate. Get ready for more noise: I think the biggest challenge facing demand generators today is simply breaking through the noise barrier. Unfortunately the noise is going to get louder, and your audience is going to be able to access more ways to cocoon themselves and avoid the noise. This means you will need to be more creative, disciplined and attuned to your buyers so that your message will connect with them. Be wary of false prophets: It’s easy to say the phone is no longer a viable asset (or cold calling is dead), that salespeople are no longer necessary, that email will disappear or whatever bold claim you want to make based upon trends early in a cycle. The danger with these claims is that there is some truth in them. However, we must all be wary and understand that many things we think will disappear won’t, and other hot items that we’re convinced will dominate the world will end up going the way of the pet rock. The bottom line here is to be sure you stay focused on the one truth that has never really changed: stay maniacally focused on solving for you customer. The companies that do that the best will be the winners.